TUESDAY | 4-9 PM Closed April 16th due to a private party. Come join us for public skate or book a birthday party, school event, or group! Join us for discount night. 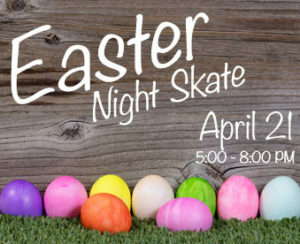 Receive half off general admission as well as half off skate rentals. Choose between public skate or choose the unlimited pizza buffet option! Public skate! 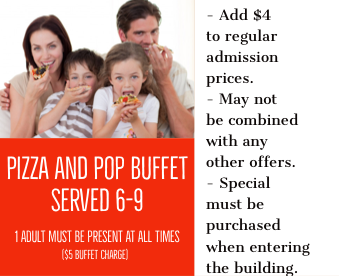 This is also a great day to book a birthday party or group event. Group pricing options available! Public skate! This is also a great day to book a birthday party or group event. Call for group pricing options. How would you like to skate all summer for one low price? 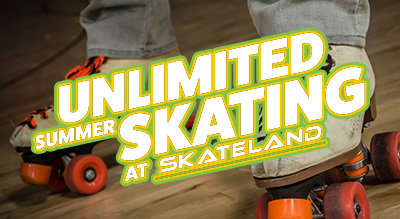 You can with Skateland’s Unlimited Summer Skating Pass! Get unlimited skating during open skate hours for all of June, July, and August for only $100 (+tax). Ages 6 and up. Skate rentals extra if needed. Wednesdays 4-9 pm 1/2 off admission. Ages 5 & under. Skate rentals included if needed. Military member with I.D. / Senior age 55 and up. Skate rentals additional if needed. Available in toddler size 8- men's size 15. Wednesdays 4-9 pm skate rentals 1/2 off. Available in youth size 1- men's size 12. Wednesdays 4-9 pm skate rentals 1/2 off. A pvc skate trainer for begginer skaters. Available in 4 sizes. Tall athletic socks available in 2 sizes, youth and adult. Unlimited skating for all public skate sessions. You must have your own skates and a signed waiver on file. If under the age of 18, it must be also signed by your legal guardian. Helmets encouraged for beginners! © 2019 Skateland. All rights reserved.